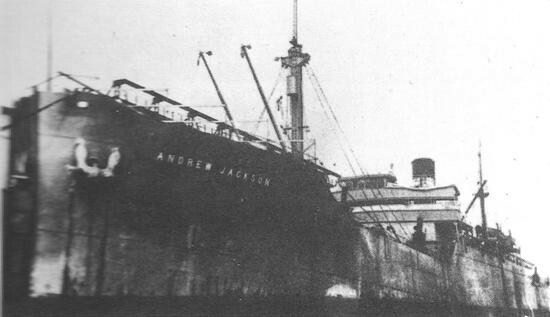 The Andrew Jackson was a 5,990-ton steam freighter built in 1920 by the Merchant Shipbuilding Corporation of Harriman, Pennsylvania. At the time of her sinking on 13 July, 1942 by Horst Uphoff in U-84 she was owned by the Waterman Steamship Company of Mobile, Alabama, to which port she was registered. The War Shipping Administration was operating the ship at the time of her loss. She was originally named Salaam for the US Shipping Board, who commissioned her, and was laid up in reserved. In 1940 Waterman bought and renamed her (Uboat.net). Named after an American general and president (think War of 1812), the Andrew Jackson was steaming between Cristobal, Panama and Key West Florida when struck. Because her position was northeast of Havana and east of Key West, it must be assumed that her skippers, Captain Frank Lewis Murdock was ordered to steam not through the shorter Yucatan Channel route, but past Guantanamo, through the Windward Passage, and up along the Old Bahama Channel. The torpedo fired by Uphoff at 21:12 (9:12 PM local) on the 12th of July 1942 penetrated the starboard side just behind the point amidships and demolished both the engine and fire rooms. This killed three men on duty there: Stuart W. Hood, Third Engineer, Betram Warner, Wiper, and Arthur W. Milloy, Fireman/Wiper. The force of the explosion had to go somewhere, and in this case it went through the deck atop the engine room – this collapsed portions of the stern (Uboat.net). Though the ship was making 11 knots at the time, the engines were stopped when she was abandoned five minutes later, at 9:17 PM. There were forty nine men total on board, including 11 Naval Armed Guard in charge of a 4-inch gun and .50 and .30-calibre machine guns. The forty-six survivors managed to launch three of the four lifeboats into clear and calm conditions about 20 miles off Cardenas Light, Cuba, which is south of the Cay Sal Bank, Bahamas. She was sunk at 23.32N/81.02W. One of the lifeboats had been destroyed by the first torpedo. Neither of the two life rafts (out of four) which drifted free were needed. After the three boats got clear of the ship a second torpedo slammed into it, sinking it immediately after two hours, at 23:12 local time according to Captain Murdock. Twelve hours after the attack, or at roughly 9 AM the men managed to row ashore at Vavendaro, on the north coast of Cuba. Captain Murdock’s war was far from over – on 18th November of the same year he was to have his next command, the Yaka, shot from under him by not just one but two submarines – U-624 and U-522 (Uboat.net).